17 Free Macro Recorder Software for Computers to Perform Repetitive Tasks: – Who knew that one day you could record your repetitive tasks on your computer? With the advancement of technology even that is possible now and with the help of something called Macro Automaton Software. Don’t you feel worn out and annoyed when you have to perform the same task over and over again on your computer? So for instance, if you fail in transporting substantial data from your Excel sheet to DBMS (database management software), rather than looking for a service provider or a programmer to assist you with you with the data transfer, you can use a Macro recorder software to transfer the data automatically. So what does Macro software really help you with? A Macro software is a tool that helps record your repetitive actions on your computer like, mouse movements, clicks, keystrokes, etc. for playback later. While it helps you record your basic automating tasks, it also lets you perform a complex task like, writing your own refined macro script for playback. So, if you are now looking for this amazing software there are plenty of options of which some of them are completely free that offer easy to use features to choose from. Make your choice from the below listed best free Macro recorder software and get rid of those tedious repetitive tasks on your computer. If you are looking for a high-quality automation and script-writing software, the first name that pops up in our mind is Pulover’s Macro Creator. This free software offers a built-in recorder, ability to record inputs in its interface and a wide variety of automation commands. You can either let the macros to be carried out from the application itself, or you can get them over to a format called AutoHotkey Script. 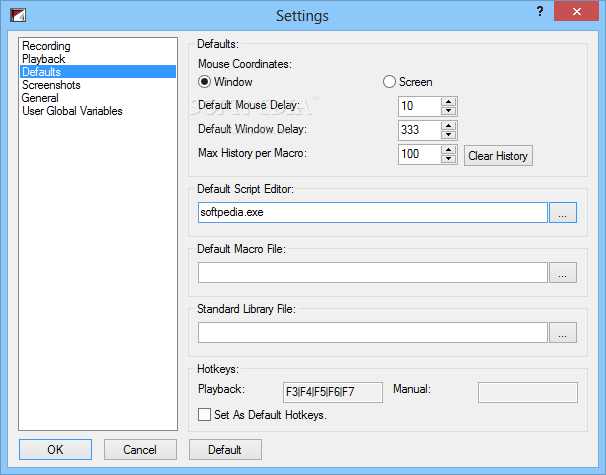 Poluvoer’s Macro Creator not only records your continuous keystrokes and mouse actions but also keeps track of your controls, look up for images, files, windows, strings while it also creates If/Else codes to regulate the Macros movement. Moreover, it’s easy to use and consumes very low memory. 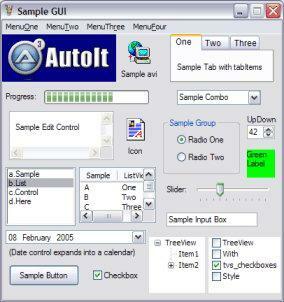 AutoIt is a free macro automation software designed for Windows that helps speed up your efficiency and hence, enables you to finish your task much faster. The program refers to a certain script file that allows it to carry out many functions like, running DOS command or Windows apps, automating the mouse moves and keystrokes, operating windows activities such as, activating, minimizing, hiding, etc. and more. 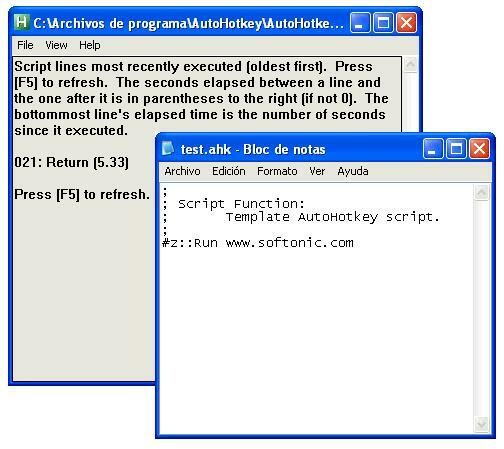 Talking of more advanced features of AutoIt, it also automates clipboard tasks and plain text, modifies the registry entries and carries out simple string operations. The best part of this program is the variety of automation options that it offers, that it’s extremely easy to use and is considerably a light weight application. One of the dynamic macro recorder tools in the category, EasyClicks Macro allows you to create macros fast and easy. You can then perform a task in just one key hit, so if any of the software that you use does not have sufficient keyboard shortcuts, you can just create one of your own by indicating the button for the operation, followed by selecting the key to be used as a shortcut. It allows you to allow multiple macros to the same key, and even fix the frequency of repetitions and the count of each step of the macro easily, and more. EasyClicks Macros provides you with all the macros together at your fingertips in the easiest way that allows you to some scripting code without the need of much learning. You can create a shortcut for your Macros in no time and adjust it as many times you want. 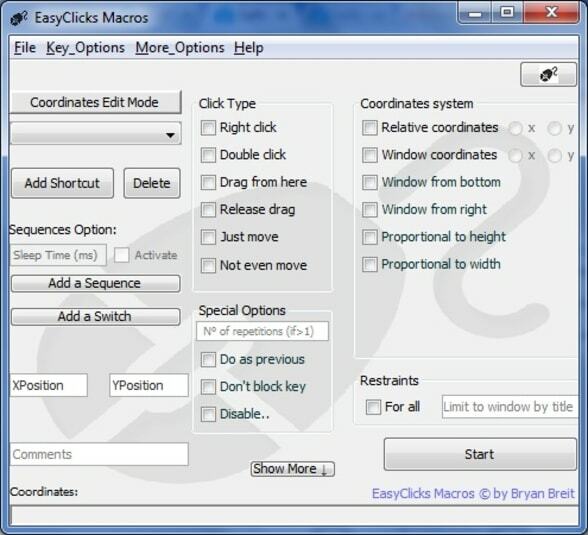 EasyClicks Macros is ready to use in a jiffy by just unzipping the files. TinyTask, as it’s named, is an amazingly small sized application (33KB only!) and therefore, is known as the smallest macro recorder software online. While it definitely features the two major functions of recording and playback, it offers more than just that. The graphical user interface of the program is so small, measuring only 137 x 48 pixels that it can get a little too small for the monitors that have high resolution. We love its simplicity as it features only six buttons in all that helps you to open recordings, save them, record and play buttons, a compiling tool that enables you to assemble the macro in a separate executable file and the tools option that lets you adjust the playback speed, change hotkeys, and even the playback speed. TinyTask is the perfect and effective macro recorder software best suited for elementary PCs allowing you to automate your repetitive actions. Looking to automate your keystrokes and mouse click to take care of the repetitive tasks? Then, what better than AutoHotKey that allows you to handle those repetitive tasks efficiently such as, typing your home address or clicking through different web pages. This open source and free software also help you write your own macro either using your hands or via the macro recorder. That’s not all, as it also allows you to create hotkeys for the control devices, like mouse, remote controls, keyboard and joystick. In fact, any of the keys can turn into a hotkey. Additionally, there’s this cool feature that helps any abbreviations expand automatically. Among its other features are its ability to adjust volume, convert a keyboard or joystick to mouse function, modify the windows to “always-on-top” mode, make it transparent or change its shape, arrange the menu items and icons according to your choice and more. Well for this time at least; don’t go by Premium tag as Mouse Recorder Premium is free macro recorder software. It is a professional macro recorder tool that helps automate repetitive tasks, as a mouse auto-clicker or enables automation for software tasks. 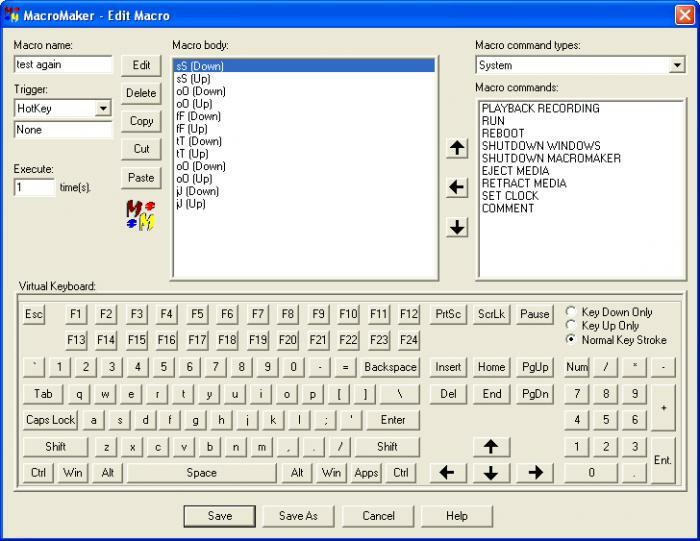 From recording your keystrokes and mouse clicks for unlimited playback, streamlining uneasy mouse movements, or optimizing timings to capturing the macro recordings step-by-step just like a tape recorder using the robust macro editor, the program has to offer a lot more than just automating the mouse clicks and the keystrokes. 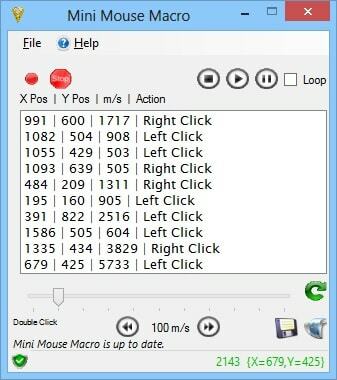 Keep a track of individual mouse movements on your monitor, arrange macros in a folder pattern for convenient analysis, restore the position of the windows of the recorded programs in case they have changed, and much more with the efficient Mouse Recorder Premium for free. Mini Mouse Macro as it’s named is a small macro automation software that is also portable. It helps record macros for the mouse actions and keyboard inputs and then even plays them back efficiently. It features an intuitive interface that makes it an easy to use application, even for the beginners. Being a portable application, it does not need to be installed and hence, you can simply add the executable file in a user-defined location on the hard disk and run it from there. You can also save this program in a media storage device like, a USB flash disk so that it can work on any computer with no past installers and with least possible effort. What’s interesting her is that the application does not attach fresh entries to the Start menu or the Windows registry and hence, it leaves no traces once it’s removed. It generates no icon when it’s launched on the system tray, and the interface remains above windows by default. Now you can keep a watch on all keystrokes and mouse movements and the actions get indexed on the interface. Here you can view the time, coordinates and definite action. While it allows you to track mouse clicks, you can also view the animation when the macro is played, and much more. You can save the macros to a file, and even change their speed and create scripts. Mini Mouse Macro consumes very less memory and responds really fast. Perhaps one of the best and a robust macro recorder software around is Perfect Automation that helps save your time with increased productivity. Useful for both amateurs and experts, this program can be used as a launcher, a recorder for mouse and keyboard, a solid script editor and as a scheduler. The best part about this software is that it does not need you to install four individual applications for the functioning, but instead all the applications are merged together to form one single program. So, there’s only one icon on the interface to be used for all functions that make it simple and easy to use software. The automation is a cake-walk that helps record in no time, while the Gentee programming language makes it easier for the programmers to make their own commands. Added advantage of Perfect Automation is that it records the mouse movements on an active window even if it has been shifted to a different spot on the screen. 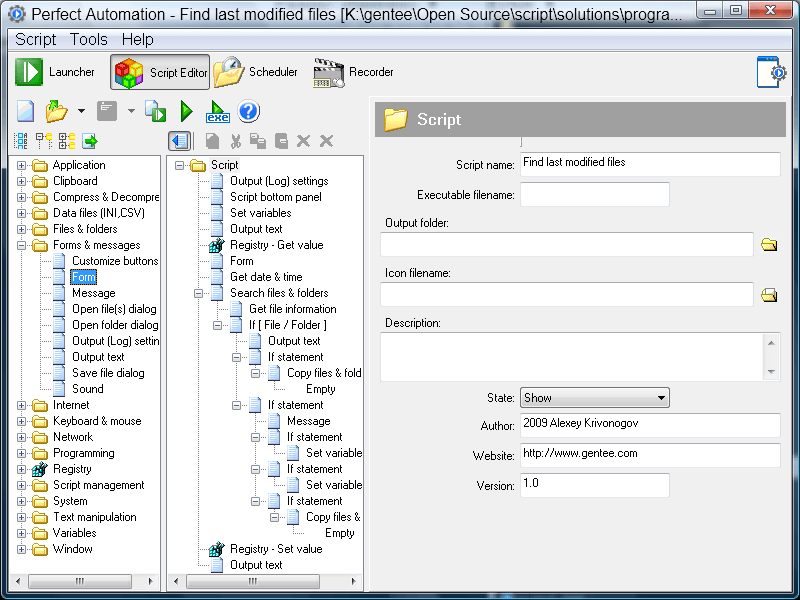 Find over hundreds of pre-developed scripts in the script editor that helps automate functions. Got to do the same work every day on your computer? MacroMaker can be the answer to your concerns that helps create all types of macros. From the easiest tasks to the most complicated ones it helps record all tasks efficiently including the recording of mouse movements and keystrokes. You can then use all the recordings and play them back at any time using the customizable keyboard shortcuts or a keyword. Even though the program may seem difficult to use at the start, with the help of its elaborate user guide you get through the macro creation process quite easily. 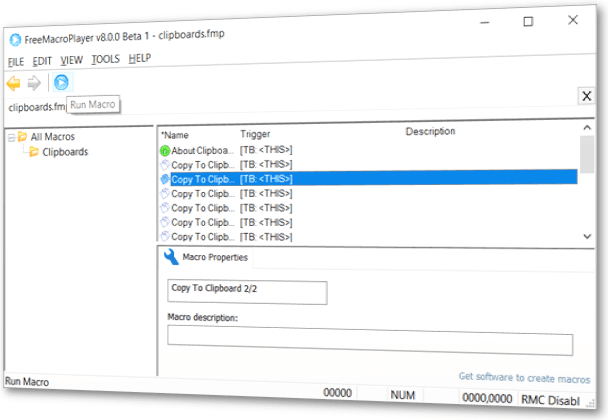 Besides the fact that you can also store clipboard content to be used later in internal MacroMaker buffer, you can create, record or schedule macros in many different ways using the variety of options available with the MacroMaker. 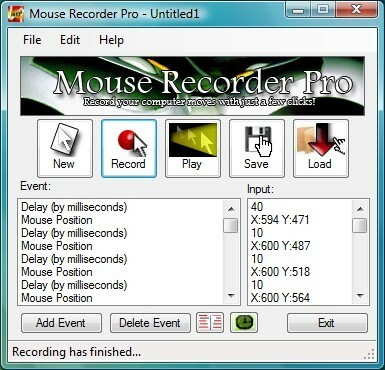 Launched by Nemex for Windows, Mouse Recorder Pro 2 is a free automation tool designed to record the mouse movements while you use your computer for repetitive tasks. Not just that it also records your keystrokes thereby, making your repeat actions really quick and convenient. You can also playback the recorded gestures while installing an application or working on it. Mouse Recorder Pro 2 is a compact and user-friendly application that offers multiple configurations options. It helps your script work quicker and easier with the help of the added functions, allows you to set a script to be played at a scheduled time via the calendar, and helps edit your scripts with the help of the editor. What’s interesting is that in addition to being able to edit the recorded stuff for added improvement, you can even play the recorded steps on the scheduled time you have set. GNU Xnee is not one single application but is instead a collection of tools that enable you to record, replay and assign your mouse and keyboard actions under the X11 environment. The website claims it to be kind of a robot that can copy your actions perfectly well. The program can used to test and exhibit different X11 applications, assign actions, record and playback macro and even retype a file. The program can even play or assign user actions to more than two machines at the same time. The fact that Xnee is a free and open source software makes it easy to be modified in order to handle special tasks. It features a library, two applications, and a Gnome panel applet. 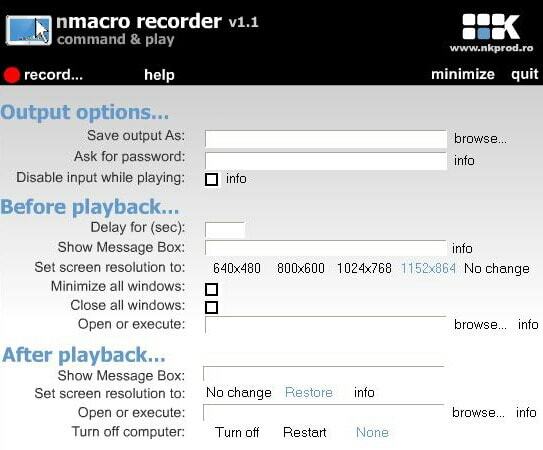 One of the other free macro automation software is nMacro Recorder that lets you record both mouse movements and keyboard inputs. It then saves them as standalone executables that can be run to recreate recorded movements on the same device or on the others. It links all messages delivered by the key and mouse movements and then saves and blinds the actions to an exe so that on the startup of the executable it will playback the recorded messages. This helps regenerate the actions performed by the mouse and the keyboard. You firstly need to fix the location where you want to save the result and assign a name before you begin recording and this is the executable file that crops up from the recording. Write the path in the field where it says “Save Record As” to get the executable or you can also click on the browse option next to it. Once your resultant path is set, you can then begin recording. You can also create a password that will be asked each time you run the output prior to playing back the recorded actions. Moreover, you can disable all keyboard inputs while the recorded actions are played from the output. So, if you want to record an event simply press the Start Recording option in red once you have set the name and path of the output. Press CTRL+BREAK to stop recording or simply click on the stop icon on the interface. Macro Toolworks is a comprehensive program which is available in the three different versions, that is free, standard and professional. This robust and all in one macro recorder software offers a broad range of macro triggers and commands like searching an image on the monitor, employing windows, variables, sending FTPs, emails and much more. However, the free version only allows you to access the basic macro commands such as recording mouse movements and keyboard inputs. Overall, the free version is elementary software featuring an easy to use and a state-of-the-art interface. 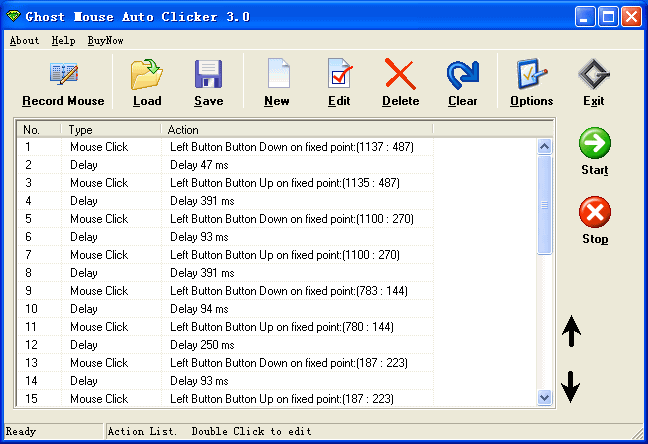 Shark Auto Clicker is designed only for your repetitive mouse actions and recognizes screenshots. This macro recorder software is specially designed for those who take interest in online casino games or any other online games, and word recognition in the chat windows. The program automatically fills the text fields with texts, helps you to record single clicks, double clicks, and right clicks, and also allows you to save and upload a project that can run continuously. You can record a maximum of 30 projects at a time. Moreover, Shark AutoClicker runs a recorded macro from the list of tracks, identifies screenshots and clicks arbitrarily. So, if you are a gamer who loves to play various kind of computer games this program is just for you. 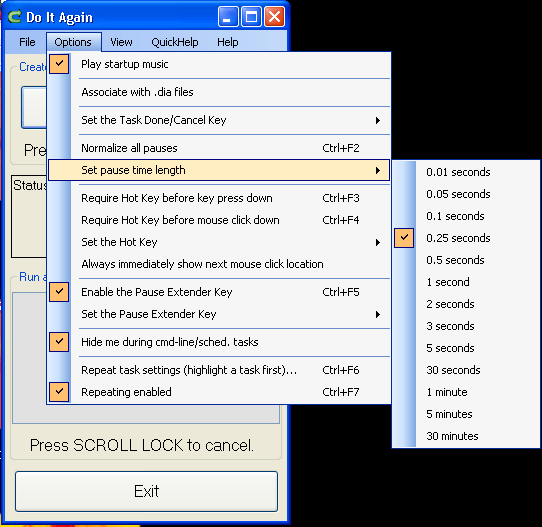 Do It Again is a free macro recording software that lets you record the repetitive tasks on the computer automatically and playback whenever required. It is a tool that effectively runs pre-defined programs and makes it easier for you to run different tasks without needing to manually load the program scripts while you are away not using your computer. Additionally, this program can also check if there any new emails, can start the anti-virus or can also backup your files. Once installed it can log you into your email or even administer the backup scripts. It offers a straightforward interface and user guides that help you to learn quick and effectively. Perhaps the most easiest of all, GhostMouse is a fabulously easy macro recorder software that features only two buttons, “Play” and “Recording” for your requirements. But those two buttons help you record and automate the repetitive tasks performed by the mouse and keyboard effectively. To record, you simply need to press the red round button and begin replicating the mouse and the keyboard events you want the program to record. If you want to replay the recorded actions you just need to hit the Play button. It also allows you to adjust the playback speed and even shuffle between the recording options from the tab that says “options” to choose which action you want to record. It not only records mouse clicks but also keyboard inputs, mouse movements on the monitor and the time lapse. 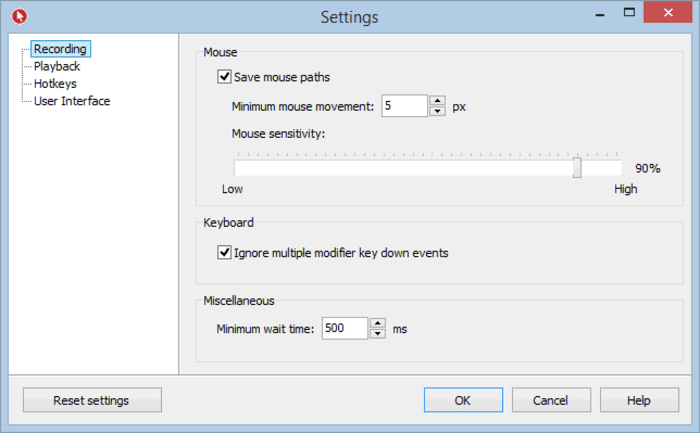 So, for those who want a simple program that helps automate only mouse actions, Ghost Mouse is just the solution for them. With only 3 steps to the entire automation and recording process, WinMacro is again another simple macro recording software that helps with the entire process efficiently. You can look for the desired location to save the recorded file, press the recording option and the Pause hotkey to stop the recording. Just go to the .log file and press the Playback option to play back the recording. If you want to cancel the playback, simply press the Ctrl+Esc hotkey. Set the frequency of repetitions and the playback speed using the “Options” button. Instead of a list of the same blah-blah, you could make a comparison of the pros and cons between those programs to actually make the article useful.